When you travel to Germany, you are going to explore a beautiful country. But first, let me introduce you to the formal stuff you need to know, visa and customs regulations that is. Who needs a visa to enter Germany? What is a Schengen visa? Which states belong to the European Union and the Schengen area? This map lists all countries that are members of the European Union (yellow). Read on, and find some answers to your questions. When you plan your holidays you don't want to spend too much time with formalities. Here on this page you will find a summary of the most important facts visitors from abroad might find useful. Germany is a member of the European Union (EU), along with Austria, Belgium, Bulgaria, Croatia, Cyprus, Czech Republic, Denmark, Estonia, Finland, France, Greece, Hungary, Ireland, Italy, Latvia, Lithuania, Luxembourg, Malta, the Netherlands, Poland, Portugal, Romania, Slovakia, Slovenia, Spain, Sweden and the United Kingdom. All EU countries plus Norway, Iceland and Liechtenstein are also members of the European Economic Area (EEA). So if you are a citizen of one of these countries, you can easily travel to Germany. A valid passport or your national Identity Card is sufficient, a visa is not necessary. b) Nationals of countries outside the EU - Who needs a visa for Germany? Visitors to Germany who are citizens of a non-EU country need a passport that is at least 90 days valid following the end of their scheduled journey. Children need their own passport, or must be included in a parent's passport. Depending on your nationality, you might even need a visa to enter Germany. 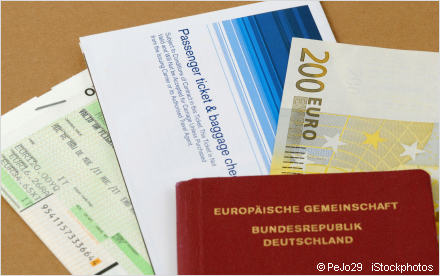 In this case, your passport must be valid for another four months after your arrival in Germany. Citizens of certain countries don't need a visa to visit Germany. These countries include the United States of America, Canada, some countries in South America, Australia and New Zealand. If you hold a passport of one of these countries, you are entitled for single or multiple visits of up to three months within a period of six months. No visa required. Please note that you are not allowed to work in Germany if you hold a short term travel visa. All visitors are required to have travel health insurance. For longer stays in Germany you need to apply for a long-term visa before you enter Germany. Exeptions apply for citizens of Australia, Canada, Israel, Japan, New Zealand, the Republic of Korea and the United States of America. They may obtain any residence permit after entering Germany. 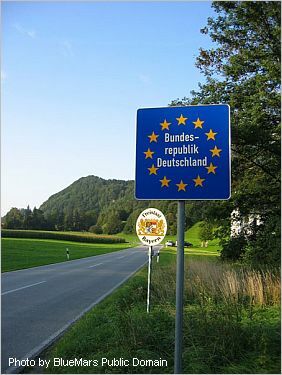 "Green border" between Germany and Austria. Citizens of European countries that are active members of the Schengen area have no border controls between their countries. All citizens of these countries can travel within the Schengen area freely. Citizens of non-Schengen countries have their passports checked when they enter the Schengen area. Depending on the country of origin, they might need a visa as well. Now here are some good news. If you come from a country that requires a visa for Germany, and you want to travel to other European countires as well, you can apply for a Schengen Visa. That means you need only one visa, and you are eligible to travel to certain countries of the Schengen area. Right now 26 European countries have implemented common border and visa provisions. A Schengen visa is valid for these countries: Austria, Belgium, Czech Republic, Denmark, Estonia, Finland, France, Germany, Greece, Hungary, Iceland, Italy, Latvia, Lichtenstein, Lithuania, Luxemburg, Malta, Norway, Poland, Portugal, Slovakia, Slovenia, Spain, Sweden, Switzerland and The Netherlands. If Germany is your main destination you apply for the Schengen visa at the German embassy or consulate of your home country. If any other Schengen country is your main destination, you get your Schengen visa from this country's embassy. For more information and downloadable Schengen visa applications (at the bottom of the page), go to the Federal Foreign Office website. Don't get confused by the fact that not all Schengen countries are members of the European Union, and not all EU members belong to the Schengen Visa zone. Please note: Germany-Insider-Facts provides this info to give visitors to Germany a general overview of entry requirements. This is NOT an official institution, therefore I cannot answer your questions. The German Federal Office provides a list of FAQ and contact information for German embassies and consulates around the world. When you arrive on a German airport and go through the customs there are usually three lines. EU citizens who have nothing to declare, EU citizens who have items to declare, and citizens from countries outside the EU. Be prepared that you have to open your baggage for random checks anytime, and in any line. 50g of perfume and 0,25 litres of eau de toilette. EU nationals can bring more goods duty-free into Germany, provided they are for personal use, and not for trading. There are several goods that are restricted or even prohibited to import or export from Germany. Strict regulations apply for weapons, medicine, animals and food. It is prohibited to import or export drugs and narcotics, even small amounts that might be allowed for personal consume in other EU countries. For more information check the German customs website. Whichever way you choose to travel to Germany, enjoy your stay in our beautiful country. How to get to Germany? Frankfurt international airport is Germany's largest and busiest airport. About 100 international airlines operate from Frankfurt airprt. Lufthansa is our national airline. Together with its Star Alliance partners, Lufthansa offers flights to and from more than 700 destinations around the world. Munich, Stuttgart, Berlin Hamburg and Düsseldorf are other major airports in Germany. All these airports offer direct flights from and to the United States of America and other destinations worldwide. Travelling to Germany by train is possible from almost all European countries. Depending on your destination in Germany, and your place of departure, a train journey might be quicker and more convenient than a flight to Germany. Use the search tool above to find a hotel anywhere in Germany. 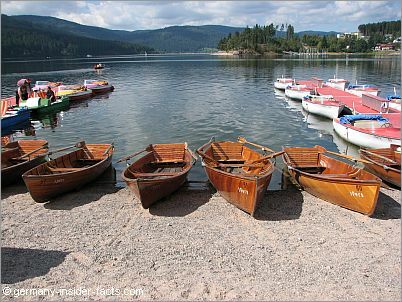 Discover Germany's attractions and travel tips, don't miss these related pages.